chinese treats from the north | tasty treats! Entry filed under: beijing, chinese, northern chinese, potato, recipe. Never learned anything, I’m kitchen-challenged. Have you tried sweet potato fries!? I love them, yet I’ve only had them twice, which is way too little. They’re so good! I have to admit that I have a weird dislike for foods that look like they should be savoury but taste sweet… like yams/sweet potato, butternut squash… :S so nope, never tried! Haha, I didn’t like those either when I was younger, but I enjoy them now! Maybe you will too!? This looks great – I’ve never had potato that was still crunchy and I know that the Japanese also have a crunchy raw potato salad. I’m going to have to try this! Best recipe from a friend? My very first college roommate was Italian and she taught me a recipe for tiramisu and introduced me to moka coffee. I never made tiramisu but moka pots are still my preferred method of making coffee at home! eric – that’s true, i never used to like pickles… but now i’ll eat pickled anything (except beetroot, ew). apparently your taste buds change every 7 years or so? i’d really like to make a tiramisu too… any handy tips? moka coffee sounds interesting.. i’m going to check that out! looks good, but try mine! Thank you sooooooooo much for this recipe, I have been searching the net for 2 days, trying different translations when I finally stumbled upon your site. Now I can feel like I’m back in China, or at least eat like it. I’ve lived in Chengdu and Shenyang…now in Taipei. Sichuan and Dongbei both have varying flavors of tu dou si, but I have yet to find it in a local restaurant here! Thanks for your recipe. I’ll just have to cook at home to eat my favorite mainland foods!!! in a restaurant in beijing, the english translation was “acid with hot potato” so i thought it would be hilarious to try…. and WOW…. ever so good. i’ll try this out. thanks for the recipe !! Thank you for posting this recipe! I had some chinese friends that would give me whole cartons of this stuff, and have also tasted it when i worked as a sushi chef in a japanese/chinese/thai restaurant. Only, it wasn’t on the menu there. The executive chef would only make it after the restaurant had closed for servers and cooks. I have been looking everywhere for the recipe ever since. You’re a lifesaver! THANKS! I had these when I was in Beijing last year and have been craving them ever since. has anyone got one for a recipe which doesn’t seem to use soy or dark vinegar, but white vinegar and the texture is almost like raw potato? i’ve tried the trying to cook them slightly and they always end up mushy. nean – there are no hard or fast rules, and you can most certainly use white vinegar – in fact it’s what i’ve used when i haven’t had zhenjiang vinegar to hand. It’s just as good. The key, as I wrote above, is to not let it cook too long and to use the right type of potato. From my knowledge and the comments left in this post, it does seem to be ubiquitous in Beijing, but it could have origins further north… who knows! i guess everyone has the way their mum taught them, a little bit like finger prints. no two are alike. Thanks a lot for the recipe! I was searching for it quite some time! can you eat this dish cold? I spent four months in China, mostly in Xi’an but a while in Beijing and a few other areas. This was one of my very favorite dishes while I was there, and it was easy to find at almost any restaurant!! I’ve been craving it for a while, so I was very excited when I found this!! 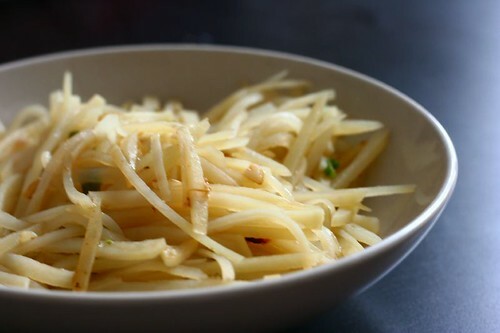 It’s a great recipe, but personally the stuff in China seemed to have less soy sauce and more vinegar… there was also some type of dried pepper in it when I ate it in China, but I haven’t been able to identify it. Any idea what this is? your recipe is the only one with exact dosages of ingredients which is great!! :) I read this with a smile! What’s up, this weekend is fastidious designed for me, for the reason that this point in time i am reading this fantastic educational piece of writing here at my house. lots of produce and other wholesome foods into your cart.